Commissioned by Chioreanu Costin who has worked with Roadburn Festival, as well as Ivar Bjornson and Enslaved on various projects, the pieces perfectly capture the essence and imagery of the periods they represent. What’s more, Costin’s involvement could not be more appropriate considering Ivar’s involvement as a curator at Roadburn Festival earlier this year. 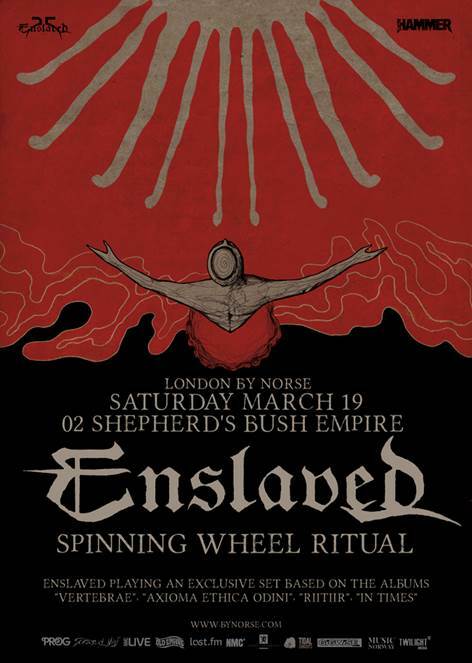 March 17th-19th 2016 will see the band perform three unique and special shows in London, launching their ENSLAVED 25 anniversary. 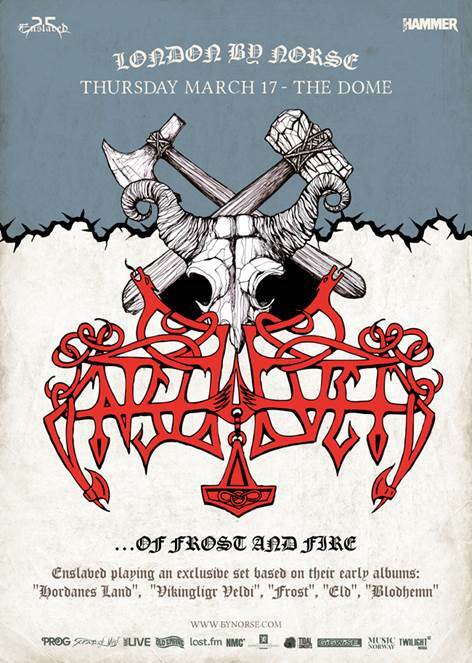 Starting with their early years, ‘Of Frost and Fire’ goes back to the roots of the band’s existence. Moving to the mid-period, ‘From the Runic Depths’ will explore the transition from old to new. Finally, ‘Spinning Wheel Ritual’ brings the audience to where the band is now: an essential and progressive artist firmly held in the esteem of fans and critics alike. 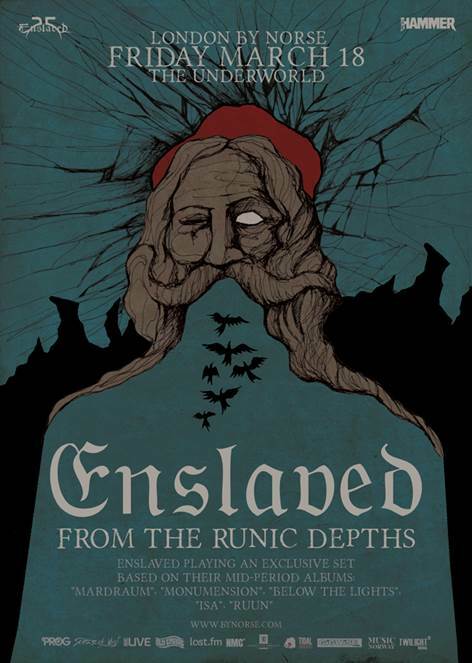 Never faltering, Norway’s iconic Enslaved continue to exist as one of the most dependable components in extreme metal’s indestructible backbone. Possessing the reputation as one of the most riveting live acts in metal, they never fail to offer us talent of the highest calibre, always doing justice to their signature extreme/black/Viking/progressive metal sound. Enslaved was formed in 1991 by Ivar Bjørnson and Grutle Kjellson releasing their first demo ‘Yggdrasill’ in the summer of 1992, their legendary mini-album ‘Hordanes Land’ coming out in 1993 with debut full length ‘Vikingligr Veldi’ arriving in the spring of 1994. Their latest release ‘In Times’ was released via Nuclear Blast in March 2015 to global critical acclaim. 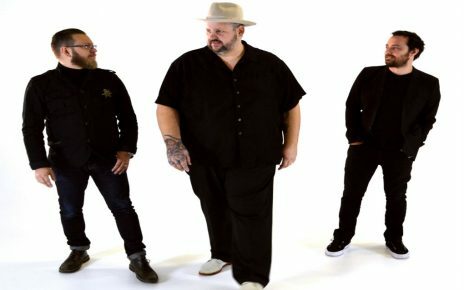 Big Boy Bloater & The LiMiTs will be releasing their brand new album Pills on 15th June 2018 via Provogue/Mascot Label Group.